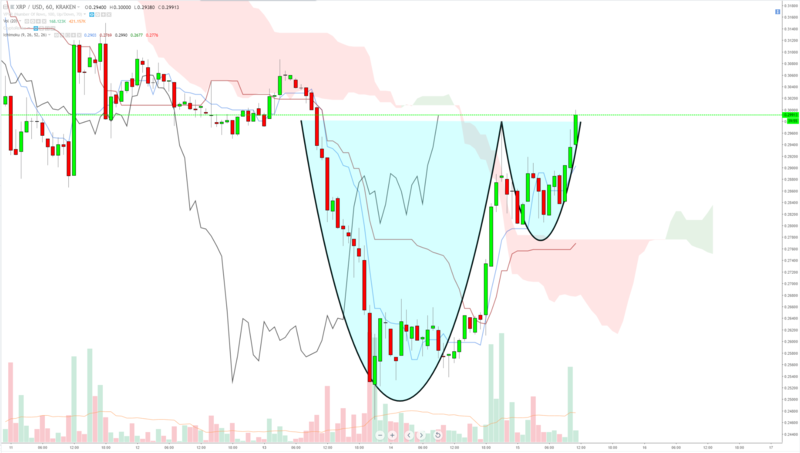 Ichimoku signals are generally the most appropriate and effective when using MTFs (Multiple Time Frames). For example, I like to use the Daily, 4 hour and the 1 hour charts. 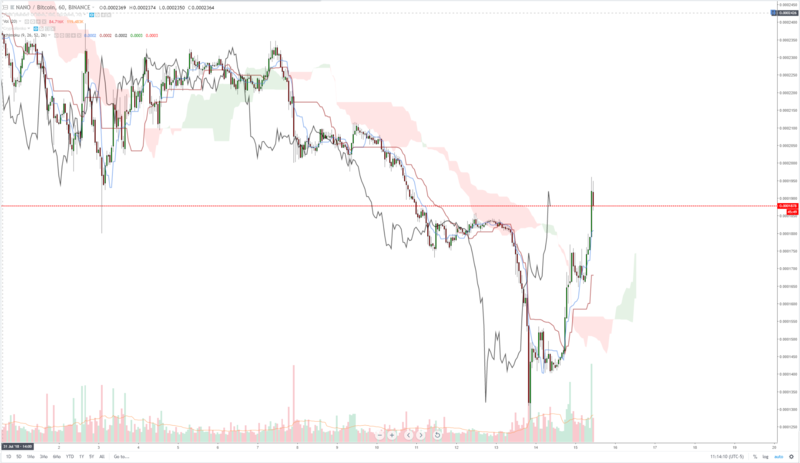 The ‘rules’ I follow are that in order for me to take long trades is that price needs to be above the cloud on the daily chart and the 4 hour chart and I take my entries on the 1 hour chart. However, waiting for all of those conditions to be met means you will sit around for a while – sometimes months. The risk and reward comes in when we play things smart and find the turns of a market early. It’s like a domino effect but in reverse. We are in a bear market so we will see the hourly turn bullish, then the 4 hour and finally the daily. Do we get long signals on the hourly and 4 hour charts during bear moves? Sure. All the time! But after a time in any market, you can get a feeling for when something may zip around. And today may be one of those days. 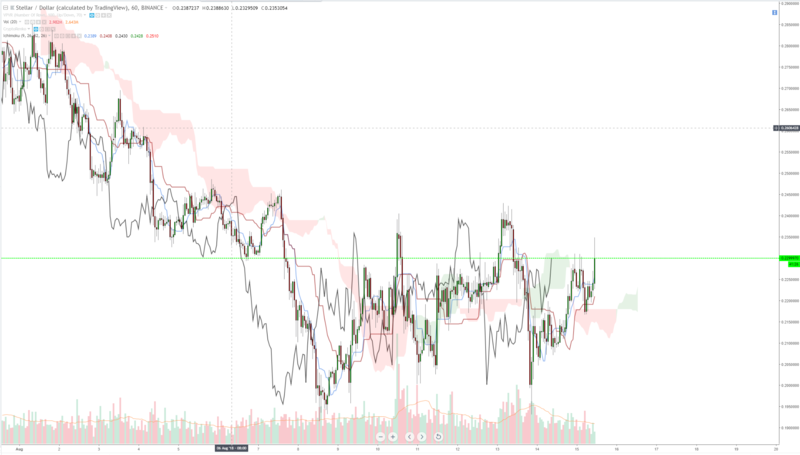 On the Bitcoin chart we have all 4 conditions met for a long trade: Price above the cloud, cloud ahead is green, conversion line > baseline and the lagging span is above the cloud. That entry zone is between 6400 and 6500. One of my favorite charts and one of the most beat-up charts is NANO – it also has a long signal with the Ichimoku system. The 0.0001850 is the long signal value area. Stellar Lumens is also near it’s Ichimoku long signal. Actually, as I’m writing this (1116 CST) XLM is sitting above that zone. 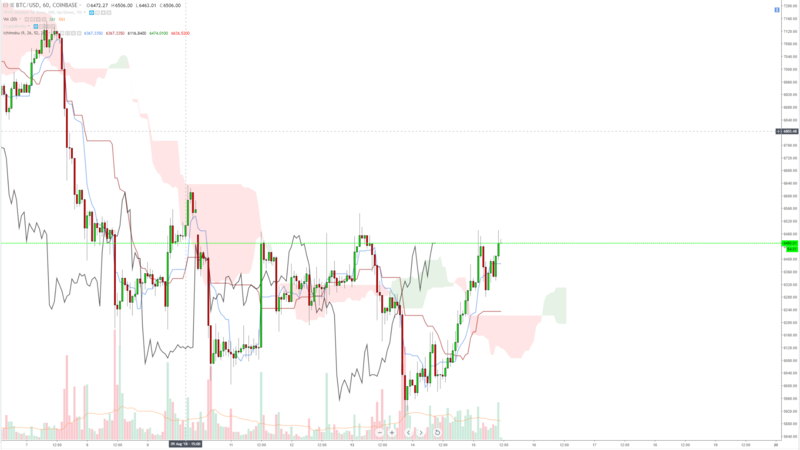 The 0.3232 value are is the long signal if price and the lagging span break and hold above the cloud on the hourly. Even though I despise Ripple, it’s still a good chart to trade. What’s neat about this chart is it is forming a cup and handle pattern right near the long signal value area, which is 0.308.